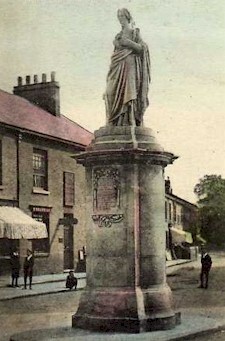 Originally, Beeston's High Road was part of the Sawley to Nottingham turnpike. During the 19th century it became the High Road, as the name implies, passing around the upper edge of the then village core. Gradually, its character changed during the 19th century and accelerated in the early 20th, to become Beeston's primary shopping street. Towards the end of the 20th century, with the trend towards out-of-town shopping and developments on the periphery of the town, its dominance began to decline - and now, in 2010, with the arrival of a major retail development between the High Road and Middle Street, a change in the shopping patterns may again be happening. It is time to record the history of the High Road. It will take time but now we make a start at its western end - known as The Square..
Beeston Square - at the western end of the High Road is the area which is now known as The Square. Early in the 20th century it was known as Post Office Square - because of the presence on its northern side, of the first purpose-built Post Office in the town - but prior to that it had been simply part of the High Road. 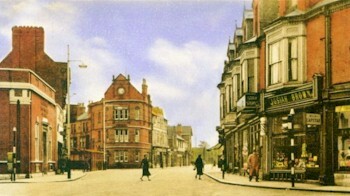 This transition reflected its growing importance and status as the commercial and administrative centre of the changing community, accelerated by the construction there of Beeston's first Town Hall, a stylish monument to the dead of the Boer War and a growing number of the more substantial retail buildings. The overall layout of the Square can be seen in the photograph on the left, probably taken in the 1950s. The view is looking west from the High Road junction with Station Road and Wollaton Road. On the right are the shops which are part of Commercial Buildings and, though the occupants have changed, here the general appearance of the building remains unchanged today. But, this is certainly not the case for the remainder of the scene. 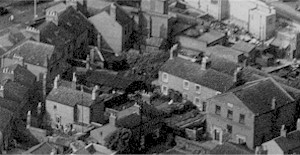 In the centre of the picture can be seen the old Town Hall, built in 1897, but put to other use after 1938 when a new Town Hall was opened at the top of Foster Avenue. On its right, Chilwell Road can be seen vanishing into the distance and on its left can be seen the top of Church Street which opened into the Square until it was closed off as part of the development of the shopping centre. On the left of the picture, the National Provincial Bank stands on the corner of Station Road, there is a glimpse of Doar's grocery store and then the tall chimneys and profile of Boots the Chemists - probably the building most missed by older Beestonians. The bus shelters clustered around the top of Church Street remind us that the Square still had through traffic in both directions - the monument had been moved to Broadgate Recreation Ground two decades earlier to help handle the increase in traffic - but today this whole area is pedestrianised and all of the buildings in the background and on the left are now gone, replaced by the Shopping Centre. In this, the first section of an examination of the development of the High Road and the stories behind those who traded and lived there, we will take a look at the part that has changed the most - the south side of The Square. The South Side - this side of Beeston Square was completely cleared and rebuilt at the turn of the 1960s/1970s to form the shopping centre that now exists, already somewhat dated and in need of the facelift that is currently being planned as part of the arrival of the proposed tramline which will pass through Beeston. There will be many in Beeston who have no knowledge of the appearance of this area before 1970, an area which is still recalled with affection by many older residents. It certainly had an interesting history and our story will reveal some unexpected connections and some interesting lives amongst those who were involved. The other section of the south side was technically part of Church Street (numbers 1-7) but was essentially always part of the Square. Set slightly back from the frontages of the first section, it can be seen in the photograph on the right. 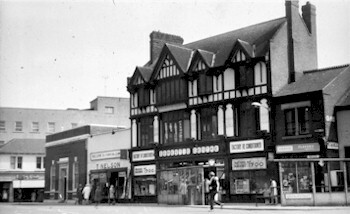 It consisted of four properties in a block that extended on the left to Mrs Bond's sweet shop (shown again on the photograph) and as far as the opening of Chapel Street on the right. This is the section that we will look at in detail first. Position your mouse on any of the properties to identify it. The earliest definite knowledge we have of this block of properties is in 1888 when it was acquired by the Beeston lace manufacturer, John Pollard from the executors of Elizabeth Gamble of Newark 2. It seems probable, however, that it had existed in its then form ("four houses, three of which are saleshops") for some time - probably since before 1861 - as the transfer refers to the occupants "then" and those that "formerly" occupied the individual properties - and it was to remain essentially in that form for most of its subsequent life. This too may explain the involvement of Miss Gamble, the known owner by 1888. As the unmarried daughter of a Newark miller, she was perhaps an unlikely person to be involved in property in Beeston. It is however quite possible that she too lent money against a mortgage on the property, probably through Nottingham solicitors, which had had to be called, or who acquired it as an investment from one of the other known mortgagees. What is known is that her sister-in-law, Ann Gamble - a flour dealer - had previously occupied one of the properties and that, by 1851 another flour dealer with Newark connections, was operating in Beeston and was occupying one of the properties - probably 3 Church Street - by 1851 5. John Pollard may have been motivated by a wish to re-establish the family's reputation - while picking up a useful investment. Elizabeth Udall (c1819-1899), was in fact an exception as she stayed in Mansfield and married George Simpson, a saddler 3. Their younger daughter, Ada Marion, stayed with her parents until after her widowed mother's death but then, aged 45, became the second wife of William Richardson a retired Mansfield printer 4. She died in 1935, leaving nearly £28,000 (almost £1.5 million in today's value). Her executors included Charles James & Charles Forshaw Vallance, the Mansfield house builders, possibly indicating that she had been successfully invested in that direction 5. Prestwood John Udall (c1824-1885), traded very successfully as a draper, clothier and furniture dealer in Clay Cross, Derbyshire with the help of his Irish-born wife Jane née Smith 6. Urban Udall (c1826-1861), had a short and tragic life. He moved to Nottingham, presumably as an apprentice, and worked successfully as a confectioner until ill-health forced him to seek refuge in his brother's home in Clay Cross, his wife attempting to continue with the business, but this became impossible after his death, aged only 35. The couple had at least five children, none of whom lived beyond early childhood 7. His widow struggled on alone for another 44 years, before her death in 1906, aged 77 8. Fanny Udall (c1834-1912), married William Hilton Machin, a Mansfield stonemason - a job that took him away and which does not appear to have helped their marriage. Eventually, it seems, they separated completely and, by 1881, William had settled in the Manchester area with another 'wife' and, eventually, their five children 9. Fanny, with three children from the early years of her marriage, fell back on her dressmaking skills and established herself as a tailoress, first in Clay Cross - no doubt with the support of her brother initially - and later in Nottingham where she lived out her life with her youngest daughter, Elizabeth 10. Samuel Udall (c1836-? ), was apprenticed to a Mansfield draper and pawnbroker before moving to London where he married and worked for a while as a furniture salesman 11. By 1872, thy had moved to the Isle of Man where a daughter was born but, by 1881, his wife had returned to live with her mother in her native Birmingham, together with their daughter 12. Charles Udall (c1839-1896), had perhaps the most remarkable life of all the siblings. At first he became well established, like his oldest brother, as a plumber in North Wingfield, Derbyshire - where he can be found at the time of the 1871 census living an apparently settled life with his wife - he had married Sarah Holloway in 1860 - and three sons. and with a resident domestic servant 13. However, things were not as straightforward as they appear as, in 1868, he had bought the Castle Hill Brewery in Douglas, Isle of Man. 1873 was the year that saw the opening of the railway line from Douglas to Peel, followed the next year by the line from Douglas to Port Erin. Seeing the opportunity, Udall built and opened the Railway Hotel in Douglas, a speculation that proved to be highly successful as, it is said, he recouped half his investment within four years. He also owned the Douglas Hotel. In 1879, he sold the brewery and acquired an interest in the Villiers Hotel (the largest hotel in Douglas - see image) which he enlarged 14. However, no doubt encouraged by this hugely successful experience, Udall used his interest in the Railway and Villiers Hotels to speculate in a London hotel - the Mona Hotel - which proved a venture too far as he was declared bankrupt in 1892. His wife and most of his family had remained in Douglas and he returned to them, dying there in 1896 15. Horatio Henry Udall himself was born in Mansfield in about 1817 but appears to have moved to Beeston very early - possibly as an apprentice - as it was in the Parish Church in Beeston where he married Harriet Hickling, the youngest daughter of a framework knitter, in May 1838. He quickly became established as a plumber and glazier and, as the business grew, the family moved from their first home on Brown Lane to the more prominent location at the top of Church Street, essentially part of Beeston's High Road. Between 1839 and 1852, at least six children were born but only three survived into adulthood. Urban Udall (1839-1913), as the only son, should have been the person most likely to continue his father's business and it seemed likely when they worked together for a time, However, after his marriage - in 1866 to Mary Anne Frettingham - the couple moved to Ilkeston where Urban operated as a plumber together with his wife's half-brother, Edwin Baguley. By 1871, it appears that the family were well settled there; they employed a domestic servant and, over the years up to 1880, at least six children were born to the couple. But then, things began to change and, by 1881 Urban had moved to Ashton under Lyne, Lancashire with their oldest daughter and was described as a 'proprietor of an exhibition'; his wife and the rest of the family, had moved back to Beeston with Mary working as a dressmaker. In 1884, Mary, aged only 47, died and after that all the members of the family eventually settled in the Manchester area while Urban found work where he could. In 1891, he and two of his sons were working in London as gas installers and, by 1901, he was manufacturing gas regulators in Ashton under Lyne. By 1911 he was even working as a market gardener, two years before his death in 1913 16. Amelia Udall (1849-1927), married, in 1874, John Thomas Crofts, a draper and hosier in King Street, Belper where the couple first settled. However, by 1881, the couple had moved to the Isle of Man as managers of the Villiers Hotel, then owned by Amelia's uncle, Charles Udall. This appears to have come to an end after 1892 when Charles Udall lost control of the Villiers following the disastrous business venture that was described above. The couple then returned to England and, by 1901, were managing the Hotel Portland in Chesterfield, Derbyshire. After the death of her husband in 1905, she moved to Blackpool with her younger unmarried sister, Julia and worked for a time in a commercial housekeeping role. She died there in 1927 17. Amelia Udall (1851-1928), never married. By 1891, she had joined her sister and her husband at the Villiers Hotel in Douglas, Isle of Man where she worked as a bookkeeper. By 1911, she had joined her widowed sister to live in Blackpool, working, as was her sister, in a commercial housekeeping occupation. She died there in 1929 18. By 1881, Horatio Henry Udall had retired to live out his life in Cottage Grove, Chilwell, died there in 1892 and was buried in Attenborough Churchyard 19. With nobody in the family apparently interested in continuing the Beeston business, Udall had relinquished the tenancy of 1 Church Street and this had been taken up by Henry Pask, a fruiterer and seedsman. Henry Pask was born in Branston, Lincolnshire in 1844 and had married Eliza Duckering, from Ingham, Lincolnshire. Each of their fathers worked all their lives as agricultural labourers and their families would have had correspondingly lowly lives, and both Henry and Eliza were working as servants shortly before their marriage in 1872. 1. Nevertheless, certainly by 1874, when their first child was born, they had somehow managed to move to Beeston and, certainly by 1881, they had taken the tenancy of 1 Church Street and had opened the shop from where they were to continue to trade for over 30 years. 2. Henry died in 1919 followed in 1930 by his widow 3. Henry Pask (1874-1945), worked as a lace draughtsman. A few years after his marriage to Edith Young in 1902, the couple moved to Sandiacre, where they raised three children 4. Alfred Henry Speedie Pask (1908-1979), became a Methodist Minister after graduating with a B.A. from Emmanuel College, Cambridge in 1930 6. Edgar Alexander Pask - known as 'Gar' - (1912-1966), graduated from Downing College, Cambridge with a double first class honours degree and qualified as a doctor in 1937 and developed a specialisation in anaesthesia. During the War he served in the Royal Air Volunteer Reserve with the rank of Squadron-Leader, as part of a team at the Royal Air Force Physiological Laboratories at Farnborough investigating ways of saving the lives of airmen forced to bale out at high altitudes, or ditched in freezing water, sometimes unconscious. During this time he selflessly volunteered to take part in experiments as a human guinea pig, allowing himself to be anaesthetised to simulate unconsciousness in water and at high altitudes. This dangerous work, which tested the limits of human endurance, led to him to be known as 'the bravest man in the RAF never to have flown an aeroplane' and is considered to be the 'father' of the modern life jacket. He was awarded the OBE in 1944. After the War he became the first Professor of Anaesthesia at Durham University and continued to contribute prolifically to anaesthesia literature and research, work that was cut short by his early death at the age of 56 7. Andrew Gordon Speedie Pask - known as 'Gordon' - (1928-1996), also graduated from Downing College, Cambridge, in 1952, with a degree in Natural Sciences which became part of a long and wide list of academic achievements. After university he was the co-founder, with Robin McKinnon-Wood, of System Research Ltd which, over some thirty years, carried out research in learning strategies, skill acquisition, group learning, problem solving, decision making and similar areas, using ideas of cybernetics which evolved in the post-war period and of which Gordon was recognised as one of the founding fathers. His work - as well as his connections with the theatre - gained him huge respect which continued after his death in 1996 8. Annie Pask (1880-1957), worked as an assistant in her father's shop and later as a clerk for a local grocer. She never married 9. The next tenant was William Torrance, who had been born in Scotland in about 1880. His parents, Arthur & Agnes Torrance had moved to Nottinghamshire in about the same year, first to Kimberley before settling in Beeston around 1885 1. By 1901, William had started to work as a lace maker - following his father and older siblings - but, within ten years he had changed the direction of his career and was working as a fruiterer and seedsman 2. During that ten years, he had married a local girl, Kate Elliott they had two daughters and had settled at 24 Church Street, Beeston 3. At that stage, William was still working for an employer - probably Henry Pask. Sometime in the next few years, however, Pask retired and Torrence took over the business and the tenancy at 1 Church Street. Their time there, however, was to be a relatively short one. In 1917, Kate died, aged only 42 4 and, in 1919. William married Annie Elizabeth Burnham 5, the daughter of George Burnham, part of the well-known local family of joiners and undertakers and Mary his wife. (Click to see Burnham family details). Then, in October 1923, William also died, aged only 43 6. In 1921, John Pollard's executors sold each of the four properties at 1-7 Church Street and the freehold of number 1 was purchased at that time by William Torrance for £500. After his death, the property continued in the possession of his widow up until 1932 when she sold it to Victor Hugo Anderson and his younger brother and business partner, Donald Chambers Anderson who traded as estate agents from 80 High Road, Beeston. Eventually, in 1963, Donald Chambers Anderson - who had acquired sole ownership in 1949 as part of a settlement of his partnership interest - sold the freehold to Beeston & Stapleford Urban District Council as part of its assembly of land and redevelopment of the central Beeston area 7. In the intervening period there had been several tenants. By 1941, the shop was tenanted by Walter Bostock, a fruiterer 8 and, in 1954, it was leased to Greenway Reeve Ltd, a local builders' merchant, here catering to the retail DIY customer. They were the tenants at the time of the photograph shown on this page. So it was the redevelopment in about 1969/1970 saw the demolition of this little shop which had served Beeston for about 120 years and whose tenants had included families that produced early pioneers in the Isle of Man, a leading fruit wholesaler, a leader in the field of anaesthesia, a pioneer in the development of the modern life jacket, a Methodist minister and a world-renowned pioneer in the new science of cybernetics - as well as several generations of the less well-known who served their community and their families well. Who would have thought it ? 3 Church Street :As we have seen, in its earliest days, this property appears to have been occupied by Ann Gamble and possibly John Johnson, both flour dealers with Newark connections, but, by the time that John Pollard bought the property in 1888, it was occupied by a tenant with a surname of Martin, who is otherwise unidentified. From 1891 however, the identity of the occupants is much clearer. By that date, Arthur Theaker had commenced trading there as a watchmaker. Theaker, the son of Thomas, a Nottingham watchmaker was born in Nottingham in 1868. In July 1890, he married Katherine (Kate) Judd in Nottingham and set up home and in business at 3 Church Street, Beeston 1. His time there was, however, a short one; although their first child was born there in February 1891, by the time their second was born in March 1893, they had moved to Lenton, Nottinghamshire where Arthur continued to trade as a watchmaker 2. By 1875, Job and Hannah Kitch had brought their family to Beeston and were looking for better times. In Broadway, Somerset where they had been bringing up a family of six, Job had worked as an agricultural labourer, a hard and low paid occupation which would have been the future for their family as well 3. In Beeston, presumably, there were opportunities in the mills which they hoped would change their lives. However, any thoughts of an easier life quickly changed when, towards the end of 1875, Job died leaving his widow and her family to make a modest income at the silk mill 4. Despite this setback, her oldest son, William Kitch, had bigger ambitions. In 1878, he married Louisa Hodgkinson - the daughter of a Beeston framework knitter - set up home on Broughton Street, Beeston and, for the time being continued to work at the silk mill 5. 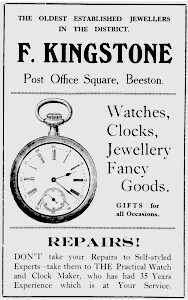 It took time for him to break away from this but sometime before 1891 he had been able to establish himself as a watch and clock repairer at 14 Wollaton Road, Beeston 6. Then, when Arthur Theaker left for Lenton, he made the move that was going to establish himself in the trade - he took over at 3 Church Street. For a time, the couple were able to concentrate on establishing themselves at the new shop, with the youngest of their three children already of school age. 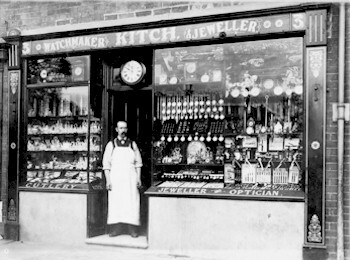 The photograph, left, probably dates from this period and shows William standing proudly at the door of his well-stocked shop. It is interesting that, according to the wording on the windowsill, he has found an additional line of business - that of optician. But, that settled life was to change when, in 1897, Louisa died, aged only 44 7 - although, with a business and a family to care for, William soon remarried. In the following year he married Charlotte Else from Ripley in Derbyshire 8 and, over the next ten years, the couple were to have five children and, by 1911, had moved to 38 Park Street, Beeston while retaining the shop at Church Street on a lock-up basis, with the living accommodation above the shop rented to others 9. Eliza Ann Kitch(1879-? ), was living with her mother's married sister - Mary Thornhill - just prior to her marriage, in 1901, to John William Oxley, a lace maker. They set up home in Sandiacre, Derbyshire - where two children were born - but later settled in Long Eaton, Derbyshire 10. Bertie Kitch(1884-1958), became apprenticed to his father and later became his assistant in the jeweller's business. In 1920, he married Henrietta Else, his step-mother's younger sister. They had no children and later moved to Nottingham 11. Emma Kitch(1886-1978), had left home by 1911 to work as a domestic servant. She later returned to Beeston to live out her life, unmarried, in the family home at 4 Cavendish Place 12. Alice Kitch(1899-1987), remained unmarried and moved, with her sister Marjorie, to Devon 13. Henrietta (known as 'Hattie') Kitch(1900-1979), also remained unmarried but stayed locally all her life 14. Marjorie Kitch(1901-1993), moved to Devon with her sister Alice and, like her sisters, remained unmarried 15. William Charles Kitch(1902-1973), was a quantity surveyor with offices at Queens Chambers, Kings Street, Nottingham. He married and had two children. 16. Eunice Kitch(1909-1989), also remained unmarried and stayed locally all her life 17. 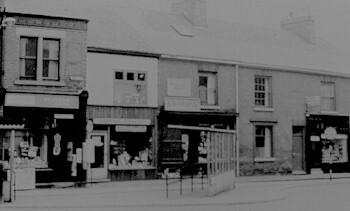 In 1921, William was able to purchase the freehold of the shop from the John Pollard's executors for £400 and, by the time of his death in September 1928, William, Louisa and his unmarried children had moved to 4 Cavendish Place, Beeston, where the remaining family continued to live for many years. In 1929, the year after her husband's death, Louisa Kitch sold the business, including the freehold of the shop, to Archibald Richard Kingstone who, in turn, sold it to his brother, Francis Leonard Kingstone in 1946. These brothers were the sons of Richard Arthur Kingstone and his wife Emily (née Newton) who had lived originally in London but had moved, first to Sandy in Bedfordshire and then to Hitchin in Hertfordshire, trading as a watchmaker and jeweller in each or these places. Their oldest son, Archibald Richard - known as Archie - and their second son, Francis Leonard each followed their father's trade. Archie had married and had moved to Nottinghamshire by the time their first child was born in 1920 and, by 1932, his brother Francis had followed, after first marrying and moving to Lancashire, and was then living and trading at 3 Church Street. His advertisement, which was featured in a Beeston street directory from about 1932, claims that he was then the oldest established jeweller in the district - it would then be about 40 years since Arthur Theaker started trading there - and pointed out the present owner's 35 years of experience - that would be from his early days as an apprentice. By 1952, the business had been sold to George Bateman who was to trade there until the property was sold to the Council by Francis Kingstone - who had retained the freehold - for redevelopment in 1963. His advertisement, dating from 1951 is shown left. 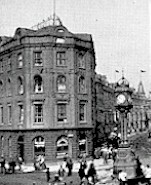 5 Church Street : this property, can be seen in the photograph (left), behind the Boer War memorial, then in the Square, in about 1905. For most of its life, as can be seen in the picture, it remained largely in the form of a private house which was the base for a plumbing business, advertised by a wall board and a simple sign at the door 1. This then would have been the exception when, in 1888, John Pollard acquired the block of four properties then described as "four houses, three of which are saleshops" - and what evidence there is suggests that was the case prior to that date. Earlier, it had been occupied by the Talbot family 2 and, by 1871 it seems to have been occupied by Martha Chambers, then a widow 3. By 1881 however, the property was occupied by William and Jane Heard and their family and they were to continue in their respective occupation there until shortly after William's death in 1925 and in family ownership for several years beyond that. William had been born in Beeston in 1852, the eldest son of William Heard (b. c1828, Beeston, Notts. d. 1913, probably in Beeston 4) and his wife Alice (née Hazzledine, b. c1832, Beeston, Notts, d. 1917, probably in Beeston 5). William senior was, in turn, the eldest son of Thomas Heard (b. c1804, Beeston, Notts. d. Mar 1885, probably in Beeston 6) and his wife Ann (née Greasley, b. Beeston, Notts c1806, d. 1897, probably in Beeston 7). Both of these two earlier generations were based on Nether Street, Beeston where Thomas worked as a cottager (that is, a smallholder) and sometimes as a lacemaker 8. His surviving memorial in Beeston Churchyard, though now badly worn, records another long-time interest - for 50 of his 81 years, he was Secretary of The Greyhound Club 9. In his earlier years, William senior worked at the local silk mill, then as a lacemaker, before establishing himself as a coal dealer, from the Nether Street location 10. Both he and his wife continued the family tendancy of longevity, each reaching the then extreme age of 85; they were married for over 63 years. Their second son, George Heard (c1855-? ), who married Emma Burrows, the sister of George Burrows (1846-1924) who was a publican and local Councillor for many years in Beeston 11. They had four children, the third of which, Joseph Heard (1877-1964), followed his uncle by giving long service on the local council 12. After World War 2, several new streets were named in honour of long-serving Councillors. including Heard Crescent, built off an extension of Abbey Road 13. Their third son, Joseph Heard (1859-1941), who led a particularly varied and active life. Born in Beeston, he worked as a lace maker, marrying Alice Williams in 1880. Much of the next 40 years, however, he spend away from Beeston, often abroad and often leaving his wife and family in Beeston. One of their children, Sydney Heard, was born in Moscow and, between 1911 and 1914, Joseph made several trips to America where he found work in a large lace factury in Patchogue, Long Island, New York. In April 1912, his wife and Sydney, their youngest son, joined him there and, in May/June 1914 he made a return visit to England and returned to Patchogue with their two daughters, Lilian and Florence. However, in July 1919, after the Great War, the family returned to England and lived out their lives in Netherfield, Notts. 14. William junior, our main focus, William and Alice's oldest son, was born in 1852 in Beeston 15 and worked as a plumber, glazier and gasfitter, for the whole of his working life, at first from his parent's home in Nether Street 16 and, after his marriage to Jane Lowe in 1875, setting up home and basing his business at 5 Church Street 17. The family were active members of the United Methodist Free Church on Willoughby Street, Beeston 18. This lifelong association was undoubtably reflected throughout their wider family connections - including those with the Lowe family which is known to have been stalwart supporters of the chapel from its origins in 1853. Their connection with this strand of Methodism - which appealed to working people - would have associated the family in a wide social network within the community, embracing the then fashionable and powerful doctrine of 'self-help' - and reflected in at least two generations of the family giving dedicated and longtime service to local Sick Benefit Clubs - then a useful form of social welfare. In William's case, he served for 40 years - up until two years before he died - as Secretary and was a Trustee of the Beeston Gravel Pit Sick Club 19. When, in 1921, John Pollard's executors sold the individual Church Street properties to their respective tenants, William Heard was able to purchase number 3 for £350. It was around this time, however, that William's health began to deteriorate and, in February 1925, he died, while sitting in his chair at his home at 5 Church Street. Although he died intestate, a formal family arrangement was agreed, which passed ownership of this particular property to his son, William Arthur Heard, subject to his widow Jane's life interest. His widow died in February 1937. 20. William Arthur Heard(1876-1955), worked with his father in the plumbing business and continued it after his father's death. In 1901 he married Eliza Ann Knowles, the youngest daughter of Henry Knowles, a stone mason who had died in 1897, and Eliza (née Lowe) and they set up home at 4 Ireton Street. Beeston. Their daughter, Edith Annie was born in 1906 and a son, Harold Arthur, followed in 1917. After his father's death in 1925 and now in control of the plumbing business, William Arthur moved his family into 5 Church Street and this continued to be the base for the business until about 1941 when the property was sold to Thomas Stone Hall, the owner of 1 Church Street, for £600 - over two generations, the property had been occupied by the Heards and been the base for their business, for over 65 years. Now, following the death of his mother and sister in 1937, William Arthur had diversified into house building in Beeston's 'Lake District' which had been opened up in the late 1930s. There, he had built several houses in Grasmere Road and moved into number 3 and it was here that he was living until just before he died in 1955. His wife had died in 1953. 21. Edith Annie Heard (1881-1937), lived with her parents all her life, never married, but did manage to have something of a career as a draper's assistant - almost certainly with her aunts Anne and Sarah Lowe who ran a drapery shop at 5 High Road (that is, on the opposite side of The Square, part of the building that is now the HSBC Bank). After her father's death, she moved, with her mother, to live at 24 Enfield Street and it was her that both were living when they each died in 1937 - Jane in February, followed in May by Edith Annie. It is also where Sarah Lowe was living when she died in 1933. 22. During Thomas Stone Hall's ownership, the ground-floor of 5 Church Street was leased to various commercial tenants while the upstairs continued in residential use; by 1948 it was in use as 'a bank' and in 1953 it was leased to Nottinghamshire County Council who, we recall, used it as a Youth Employment office. In 1951, Hall had sold the property, together with 7 Church Street, to A E Hawley & Co Ltd (the dry cleaning firm that later became Sketchley Ltd) which, in 1955 sold both properties to The Prudential Assurance Company, possibly as part of a sale and lease-back arrangement. Finally, in 1964, the two properties were sold to Beeston & Stapleford Urban District Council as part of its land assembly programme, in preparation for the redevelopment of the Central Beeston area 23. William Humphreys (1830-1893), who married Elizabeth Wyer, became a partner in the important Nottingham firm of lace machine builders, Humphreys, Botham & Wyer, who operated, by 1870, from their factory and foundry, Portland Works, at Portland Road in the Radford area of Nottingham 4. David Botham, another of the partners, had originated from Hucknall, Notts but had lived in Beeston, lodging at the Crown Inn, since at least 1841 5. As another machine builder, he was quite probably already associated with William and his father when they too were working together in Beeston. In 1861, Botham was boarding with William and Elizabeth so, it appears that whatever the motivation for the Nottingham venture, it is one that the men took together 6. Isaac Wyer, the other partner, was Elizabeth's brother and son of Isaac senior, himself a machine builder. When, in 1863, David Botham married Abigail Wyer, another of Isaac's sisters, all of the three partners became brothers-in-law and, by 1881, they were each occupying adjacent homes near the factory on Portland Road 7. . Together they were operating a very successful lace machine building business - mostly Levers machines - during a period in which mechanisation became widely adopted in the industry and the Nottingham-based specialist builders were in most demand. As a result, it seems, the partnership was highly profitable with each of the families prospering well financially as a result. David, the oldest of the three, died in 1882, William Humphries died in 1893 and Isaac Wyer, the last of the three, died in 1914. 8. After their respective deaths, it seems that the business was successfully continued by their families until the death of Isaac's son - Isaac Francis Wyer - in 1919 at the early age of 37 which appears to have caused the firm to merge with the firm of Spowages. William and Elizabeth had one child, Edith Elizabeth Humphreys (c1856-1937) who married Frederick William Burton (1862-1932), a machine builder who became part of the family firm. Edith and Frederick had three sons; William Humphreys Burton (b. 1889) who went into banking and Frederick Francis Burton (b. 1891) who continued the machine building tradition. The youngest, Harold Victor Burton was born in 1896 9. Sarah Ann Humphreys (1842-1927) married Henry Walker in 1865. He traded as a watchmaker at 22 Milton Street, Nottingham, a business that was continued after his death in 1905 by two of their four sons 10. Joseph Humphreys (1845- ?) first worked with his father as a watchmaker before leaving for Manchester in about 1870. In 1874 he returned to Beeston to marry Hannah Cross Frettingham, the daughter of Henry Frettingham, a well established Beeston nurseryman and his wife Rebecca. Joseph and Hannah then returned to the Manchester area and, after a few years, settled in Sale, Cheshire where Joseph continued to trade as a watchmaker 11. As we have seen Joseph Humphries retired in about 1878 and number 7 Church Street then had another tenant and another use. William Walker Tipton was only about 20 and newly married to Annie Jackson when he started trading there as a baker. He had had a difficult start in life; born in Newark in 1858 to William Tipton, a baker, and Jane (née Walker), his mother had died, aged 33, in 1871 when William was only 13, followed by his father in 1876. Although it is not clear how a young man in these circumstances could set-up in business and why he chose to move to Beeston with his new wife is not absolutely clear but it may well be that he benefited from another intervention by the owner of the Beeston premises, Miss Gamble - who, we have already seen, was the daughter of a Newark miller with a sister-in-law who operated as a flour dealer. It seems that he may have been the beneficiary of a combination of their benevolence and self-interest. Jenny Tipton (1879-1936) married Horace Wheatley, a Beeston plumber, in 1904. Horace was the son of Richard and Mary (née Burnham - click here for more of this family connection). Initially, they settled in Queens Drive, Nottingham, taking in Jenny's retired father and, for a time, two of her younger brothers but, by 1916 when twins were born to the couple, it seems they had moved to Skegness where they lived out their lives. Jenny died there in 1936 and Horace in 1956. The couple had four children including the twins. Arthur Tipton (1881 - ?) was working as a joiner in 1901. No further details have been found. Robert Tipton (1884 - ?) was worked as a baker, first as his father's apprentice and then for others, apparently in Nottingham. Nothing else is known about him. Percy Tipton (1886 - ? ), one of twins born to William & Annie in October 1886. After working for his father as an errand boy in around 1901, nothing else is known of him. Emmy Tipton (1886 - 1886), the other twin who died soon after her birth. Fred Tipton (1893 - ? ), was apprenticed as an electrician by 1911. Again, nothing is then known of him. Mabel Elizabeth Pears (1880-1972) was born in Nottingham, married Charles Henry Carlow, a brass finisher, in 1908. The couple settled first at 10 Penryn Terrace, Dane St, Nottingham where they had two sons before moving to Charles' native Birmingham. Mabel died there in 1972, aged 91. Ernest Samuel Pears (1881-1936) was born in Chilwell, Nottinghamshire, married Kate Twigger in 1907 and settled first at 54 Burford Road, Nottingham with Ernest working as a cashier for a wallpaper merchant. The couple had three children and eventually moved to 159 Ilkeston Road, Nottingham where they were when Ernest died in 1936. Kate was a widow for over 31 years, before her death in 1968, age 85. Edith Hannah Pears (1883- ?) was born in Beeston, Nottinghamshire and was with her parents in 1901. Nothing is known of her after that date. Gertrude Sarah Pears (1886-1981), was born in Beeston and stayed with her married sister Mabel after her father remarried, working as a blouse machinist. In 1919, she married Michael Mulrooney in Bradford, where they raised three daughters and lived out their lives. Gertrude died there in 1981, aged 94. Joseph Blasdale Pears (1888 - 1898), was born in Beeston and died there, aged 10. Charles Henry Pears (1891-1974), was born in Beeston and stayed with his married sister Mabel after his father remarried, working as a grocer's assistant. In 1915 he enlisted in the Royal Garrison Artillery and was wounded towards the end of the War, apparently receiving a small pension as a result. In 1918, he married Elsie Nall, the daughter of William Henry Nall, a Sneinton grocer and baker and, may well have resumed his career in association with him. Both Charles and Elsie died at the beginning of 1974. It appears likely that Mabel, Joseph's eldest daughter, took over the household duties and the care of the younger children - and, it seems, continued to do so after Joseph married again in 1909, even though Mabel herself had married in 1908. Joseph's second wife was Jane Ann Lee, then aged 49 and previously unmarried having worked as a schoolmistress and stayed at home. with her widowed father at their home in Sneinton. Now, her life was changed from that relatively gentile existence particularly, one would expect when, by 1911, the couple were running a grocery and provisions shop at 362 Radford Rd, Nottingham. Joseph died in 1921 followed by his wife Jane in the following year. In 1888, when John Pollard purchased 7 Church Street and the rest of the block, the tenant was Amos Bowley, a local tinsmith and ironmonger. This business had evolved from one started by Thomas Hudston (1818-1877) on Beeston High Road in the first half of the 19th century. Amos had been apprenticed to Thomas and, in 1872, had married Thomas' daughter, Mary Eleanor Hudston. See more about Amos Bowley and Thomas Hudston's family here. Amos Bowley himself was born in Chilwell, Nottinghamshire in 1843, the eldest child of Amos and Mary (née Clewley) Bowley. Members of the wider Bowley family had worked as framework knitters in the Chilwell area after their arrival there from the Gotham area, south of the River Trent, towards the end of the 18th Century. The poverty suffered by many within this trade are well documented so it is not surprising that other careers were sought wherever possible. One of Amos senior's brothers had left for America and others had diversified into the relatively stable and fashionable lace making trade. When Amos junior was able to secure an apprenticeship as a tinsmith with Thomas Hudston of Beeston, it would have been seen as a fortunate opportunity - and that is certainly how it turned out. After the completion of his apprenticeship, the young Amos Bowley continued to work for Thomas Hudston and married his eldest daughter, Mary Eleanor Hudston, in 1872. After Thomas' tragic death in 1877, Amos continued the tinsmith and ironmongery business and, by 1888, had been able to move his business to 7 Church Street. 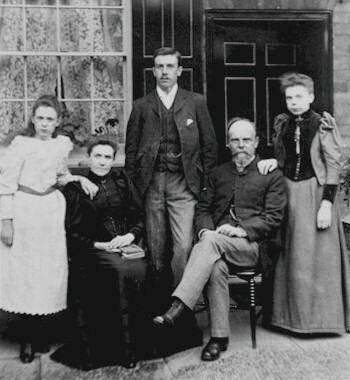 Amos is shown left, in about 1890, with his wife Mary Eleanor, his son Walter Ernest, daughter Emily ('Totty') on the right and younger daughter Eleanor on the left. In 1903, after several years of failing health, Mary Eleanor died and, in 1905, daughter Eleanor married, following which Emily ('Totty') Bowley kept house for her father and increasingly ran the business. Amos died in 1912 and, after a while, Thomas Stone Hall, Eleanor's husband joined the firm which then became known as 'Bowley & Hall'. In 1921, Thomas purchased the freehold of 7 Church Street from the Pollard Executors and, in 1941, bought 5 Church Street from the Heard family. 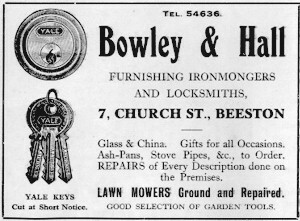 In 1951, both properties were sold to A E Hawley & Co Ltd (which became Sketchley Ltd) after Thomas Hall retired and Bowley & Hall was closed down. Number 7 then opened as a dry cleaners shop and continued as such until the property was sold to the Council for redevelopment in 1964. Walter Ernest Bowley (1872-1941) became an Elementary School teacher, first at the Wesleyan school on Chapel Street, Beeston. In 1897, he married Louisa Mortimer, also a teacher at the school, the daughter of George Mortimer, the head teacher there. By 1899, the couple had moved to Kirton in Lindsey, Lincolnshire where Walter had taken a position as schoolmaster and, by 1911 they had moved to Cleethorpes where Walter had taken another post as schoolmaster. Soon after this, however, he moved away from teaching, taking a position as a Company Secretary and they eventually moved back to the Nottingham area. Prior to his death in 1941, he was living at 7 Abbey Road, West Bridgford, Nottingham. Louisa died in 1954. The couple had two daughters, one of whom died as an infant. Emily Bowley (1874-1963) - known as 'Totty'. Despite suffering from a spine deformity, she kept house after her mother's death, was able to assist her father in the shop and appears to have run the business for a while after a father's death in 1912. She remained single and died in 1963, aged 89. Eleanor Bowley (1878-1948) - married Thomas Stone Hall, who was working in the railway engineering department, probably at Long Eaton as they first made their home at nearby New Sawley, Derbyshire at 89 Wilsthorpe Lane. Soon after Amos Bowley's death in 1912, it was decided that Thomas would join the family firm - which then became known as 'Bowley & Hall'. Eleanor died in 1948 and Thomas then retired to live at 2 Foster Avenue, Beeston. Eleanor and Thomas had two daughters. In 1951, Thomas married Annie Louise King, the owner of 2 High Road, Beeston, a sweet and tobacco shop next to 1 Church Street, previously operated by Miss King but then leased to Alice May Bond. Annie died in 1955 and Thomas in 1960. This completes the first stage of our look into the story of Beeston High Road - a study that has already revealed several remarkable individuals amongst the many who simply lived as part of the community - but nevertheless played their part. We look forward to finding more of interest as we continue our journey along the High Road.